Labeeb Ena came to Australia earlier this year as a refugee after fleeing war-torn Iraq. Within three months Mr Ena, who owned and ran a supermarket in Iraq for many years, was working at Woolworths’ Liverpool store as part of the retailer’s refugee employment program. Mr Ena, who also worked as an English language teacher in Iraq, had high levels of written and conversational English and extensive experience in the supermarket industry, but had struggled to find employment when he first arrived in Australia. Woolworths has hired 45 displaced refugees under the program, a partnership with Community Corporate, and is aiming to employ another 100 over the next year. Its efforts in employing refugees, Indigenous staff and people who identify as LGBTI, and closing the gender pay gap have been recognised by global information and media firm Thomson Reuters, which has ranked Woolworths first in Australia and 14th globally in its third annual Diversity & Inclusion Index. The Diversity and Inclusion index ranks the top 100 publicly traded companies out of a global pool of more than 7000 and measures 24 metrics across four key categories – diversity, inclusion, people development and news controversies. The index is calculated by weighing each metric based on importance in the market and how each company compares with its peers. It is used by ethical investors to assess companies on corporate social responsibility. Woolworths’ chief people officer Caryn Katsikogianis said the ranking reflected the retailer’s focus on diversity and inclusion over several years. “We are a community-based business, we have a very diverse community, we want to represent the communities in which we operate [and] for us to do that we want to create a very inclusive environment and part of inclusiveness is creating a diverse team,” Ms Katsikogianis told The Australian Financial Review. “We know with diverse teams you get best thinking, better innovation and better levels of engagement. According to a survey by Chief Executive Women (CEW) published last week, there are still 23 companies in the ASX200 with no women in their executive leadership teams, including JB Hi-Fi, Woolworths’ spin-off Shopping Centres Australasia, BWP Trust, GUD Holdings, GWA Group, Sirtex Medical, Southern Cross Media, Washington H Soul Pattinson and Whitehaven Coal. 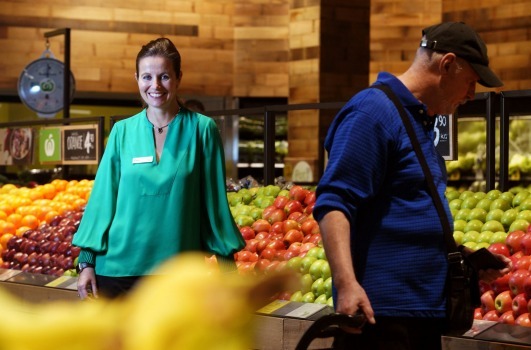 At Woolworths, women account for 54 per cent of its total workforce, 41 per cent of management roles and 32 per cent of senior leadership and executive roles. For example, Claire Peters is managing director Woolworths Supermarkets, Amanda Bardwell is managing director of WooliesX, the retailer’s new digital hub, and Natalie Davis is managing director of Woolworths New Zealand. Over the last two years Woolworths has reduced the gender pay gap to less than 1 per cent – a fraction of the national average of 14.6 per cent – after undertaking line-by-line reviews and giving pay rises where gaps were identified. Woolworths also employs more than 1900 Indigenous Australians and earlier this year was recognised as the first retailer to achieve gold-tier status in the Australian Workplace Equality Index awards as part of its commitment to LGBTI inclusion.